Modeling urban communities has been designated as a high priority target for improved systems engineering [INCOSE SE Vision 2025]. World population is increasingly urbanized. In the US, the percentage of the population in metropolitan areas has shifted from 7% in 1820 to 51% in 1920 to 82% today. China looks to make the same shift in under 100 years. This shift carries multiple risks. As population concentrates, local sources of food, water, and other resources become insufficient and the dispersal of waste products becomes a greater and greater environmental threat. The systems we have built to service our needs have made us more interdependent, but the ad-hoc systems developed to meet these needs have been driven more by political compromise than systematic planning. System resiliency and sustainability have often been secondary concerns. New technologies offer both new opportunities and new vulnerabilities. Modelers of urban systems face all the challenges of systems engineering, often at heightened levels. Urban systems are enormously complex, so our modeling approach must give us both the ability to grasp the model architecture at the highest levels and to drop quickly and efficiently to finer levels of detail. It must make explicit the interactions between urban subsystems. It must facilitate modeling of multiple variants representing different cities. Finally, it must allow easy incorporation of new technologies with the potential to critically impact urban systems for good or bad. The ability to simulate the urban environment may be the single greatest benefit of modeling cities. Simulations can optimize existing systems and evaluate prospective changes for cost and effectiveness. They can investigate system resilience to subsystem failure and project sustainability over long time horizons. However, the diversity of urban simulation models is enormous. They derive from multiple disciplines in engineering, economics and the social sciences and individual modelers use a wide array of commercial and custom digital simulation tools. The modeling approach must accommodate federation of multiple disciplines and digital tools. No single individual can model an urban system in useful detail, so the project is intrinsically collaborative. Beyond the modelers, the political nature of urban governance requires that all stakeholders provide input on project objectives, feedback on work-in-progress, and access to results in a useful format. All these needs mandate a sophisticated digital infrastructure for requirements, project management, data visualization, document generation, and other modeling input/output activities. MBSE is based on the idea of capturing all system information in a single, unified digital model. For complex systems, this single model is often a federation of multiple models distributed across multiple tools and repositories, which we refer to as the Total System Model (TSM). 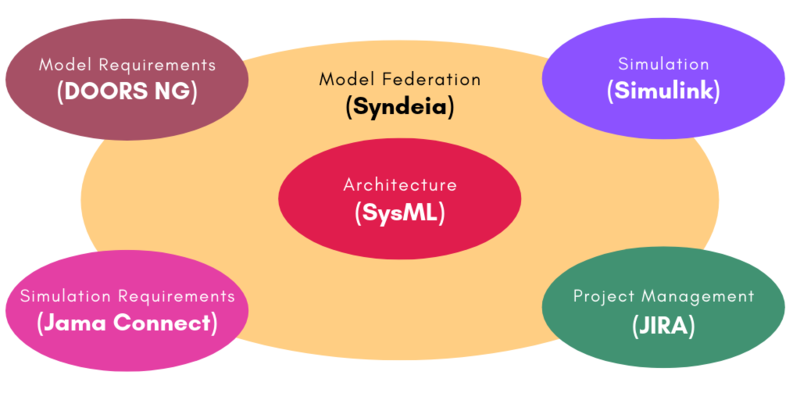 At Intercax, we believe that the practice of MBSE, using OMG SysML as the architectural modeling language, provides a powerful approach to meeting the challenges of urban systems. SysML is not indispensable to MBSE, but it can be highly useful for a number of reasons. First, it is a graphical, object-oriented modeling language. SysML diagrams can be tailored to purpose and audience without affecting the underlying model, which helps address complexity management. As an object-oriented language, it lends itself to reconfiguration and re-use in building different urban models. Second, SysML is supported by multiple software vendors and these SysML modeling tools provide interfaces to other engineering software tools for PLM, ALM, CAD, simulation and other purposes. As a language that treats requirements, behavior, structure, and analysis with equal respect, SysML models can act as a high-level roadmap and an efficient clearing-house for system data. In this new series of blog posts series, I will demonstrate some of these ideas as applied to urban systems modeling. 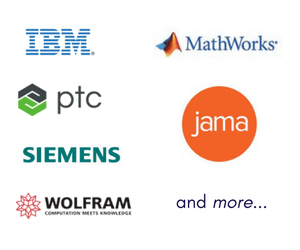 Our example (Figure 2) uses Syndeia, an MBSE interoperability platform from Intercax, to federate models in SysML (Cameo Systems Modeler from No Magic or IBM Rational Rhapsody), DOORS NG (IBM Rational), Jama Connect (Jama Software), Simulink (The MathWorks) and JIRA (Atlassian). Note that this toolset is not unique; other tools could be readily substituted to similar effect.